6 September. The first units of the Eighth Route Army enter Mukden and receive captured Japanese military equipment from the Soviets. The CCP strategy now becomes to strengthen its position in the north and remain on the defensive in the south. More troops under the command of Lin Piao enter Manchuria and establish themselves in rural areas. 13 September. Apart from promoting unification with the Mongolian People’s Republic, the Inner Mongolian People’s Revolutionary Party skilfully negotiates with communists and nationalists in northeast China. Party members are allowed be members of the CCP and KMT as long as they keep their original party principles. The party convenes its second general congress and decides to set up an eastern Inner Mongolian provisional government that would replace the Hsingan provincial government and have a higher level of autonomy than the latter. 10 September. At a people’s congress convened in Sunid and attended by representatives from the Mongolian People’s Republic, a provisional government of the ‘People’s Republic of South Mongolia’ is established. An organic law for the new republic is passed five days later and, on the 16th, MPR leader Choibalsan pays a personal visit to honour the new government. 19 September. The CCP central committee releases its strategic directive, which emphasizes its intention to ‘develop into the north and defend against the south’. In so doing, it hopes to deter southern Nationalist forces from advancing northwards and for the CCP to take sole control of Jehol, Chahar and Manchuria. 30 August. After a visit to the Soviet embassy in Ulaanbaatar by Choibalsan and President Bumtsend, the Mongolian People’s Republic begins focusing on securing Outer Mongolian independence and, at least in public, treating calls for Mongol unification with eloquent silence. 9 September. Although they understand the implication of the Sino–Soviet Treaty is that the unification of Outer and Inner Mongolia is not acceptable, the leaders of eastern Inner Mongolia and members of the Inner Mongolian People’s Revolutionary Party do not want to give up hope. They send a letter to Choibalsan, expressing their wishes for unification with the MPR and ask him to pass on their request to Stalin. On the following day, similar letters are sent to the Soviet Army Headquarters. 17 September. 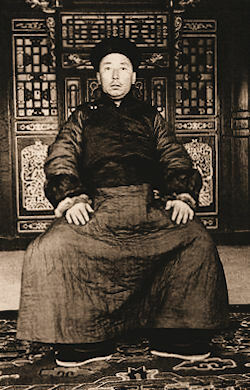 Mao Tse-tung is informed by the Soviets that Soviet–MPR forces are ready to withdraw from Inner Mongolia. In violation of the Sino–Soviet friendship treaty signed with the Nationalist government a month earlier, the CCP is invited to take control over part of the region.